by Gerard McNally. Published on 24 January 2019. Here are some definitions (with which many readers will, no doubt, already be familiar) that are pertinent to the discussion that lies ahead. A prime number is commonly defined as “a positive integer with exactly two distinct factors: unity and the prime number itself”. If a number is not prime, it is termed composite. The first positive integer, 1, is considered neither prime nor composite. 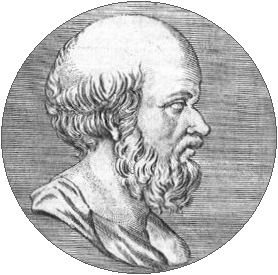 Greek mathematician Eratosthenes is also credited with being the first person to estimate the Earth’s circumference. Image: Wikimedia commons. An algorithmic approach to identifying all primes less than a given number has been known since ancient times. Attributed to Eratosthenes, who lived in 3rd century BCE Greece, it works as follows. This algorithm, characterised by separating the primes from the “unwanted” composites, is widely known as the sieve of Eratosthenes. An initial observation might be that each iteration produces only one new confirmed prime. However, a quick check of the third iteration shows that all unconfirmed numbers in black type are, in fact, prime. This observations, of course, rely on our being able to recognise primes by inspection or to perform some other test, independent of the sieve algorithm (which will, of course, upon further iterations, confirm our findings). As a schoolteacher, I want my learners to be able to execute the algorithm to identify primes; but I don’t want this done blindly. I want them to discover the interplay between primes and composites, and the richness of understanding of the positive integers that this reveals. The sieve algorithm is often carried out on a grid, resulting in something like this (with 1 omitted and after the multiples have been struck out). 2 3 . 5 .. 7 . . ..
11 .. 13 .. .. . 17 .. 19 ..
31 . . . .. .. 37 . . ..
41 … 43 . .. . 47 .. . .. However, my earlier representation of the individual iterations helps, I feel, to slow down the process allowing pupils to notice how it unfolds and to spot any emerging patterns. A conspicuous feature I would like to draw attention to at this stage is the level of duplication in striking out composites. The grid above also contains a dot for each “strike” (which, of course, provides a factor count for each composite). Consider, now, the list form of second iteration. A pattern emerges in the distribution of confirmed composites. (Recall that, by the sieve algorithm, numbers in black type may or may not be composite-–or prime-–but numbers in blue have been verified composite). The sequence is represented again below, this time using C to denote composites, P for primes and ? to denote numbers of unconfirmed status; the colour convention used above is retained. Notice that, from the sixth term onwards, the composites alternate in groups of three and one. It is not difficult, based on the workings of the algorithm, to become convinced that this pattern will persist indefinitely. This implies that primes can only lie immediately before or after a multiple of 6, a result that is not at first obvious but is easy to understand, and prove, once discovered. Given the difficulty in deciding whether a large number is prime or not, a quick division by 6 can rule out as composite any number whose remainder is not either 1 or 5. Eratosthenes’ sieve is clearly based on the kind of definition of a prime given above, with its focus only on factors. But this definition does not do full justice to the importance of primes which, as their name suggests, are the first numbers: the numbers from which all other numbers can be constructed using multiplication. A commonly used analogy is with the chemical elements, from which all substances are built; this likens the primes to distinct atoms (or the monatomic gases) while the composites correspond to compounds from simple ones like water or salt to the biochemical macromolecules. Those positive integers greater than unity which are not themselves the product of two or more smaller numbers but from which, collectively, all composite numbers arise as products. This definition suggests an alternative algorithm. Here are the first three iterations of this algorithm for the numbers 1 – 50, in tabular form. In the first iteration, above, the first prime (shown red) and four composites (not necessarily the first four – shown in blue) have been confirmed; all remaining numbers (black) are of undetermined status. Iteration 2 has two confirmed primes, giving rise to a total of twelve composites within the range under consideration. The third prime and eight more composites appear in iteration 3. What is the first composite that will be determined by the next iteration? What does this tell us about the numbers before the next composite whose status (prime or composite) is not yet determined? How many iterations are needed to be sure of finding all the primes below a given number? To conclude the discussion, I believe that by combining a slowed-down application of the sieve of Eratosthenes in conjunction with the revised algorithm offered above we can open doors to an abundance of mathematical ideas, including those underlying some of the greatest works in the history of the discipline such as Euclid’s proof of the infinitude of primes, the prime number theorem and the Riemann Hypothesis, to name but a few.